Recently, the latest version of HDMI was announced. HDMI 2.0 brings a plethora of changes including high frame rates, better support for 4K content, and a number of other features that are designed to make the format future proof. 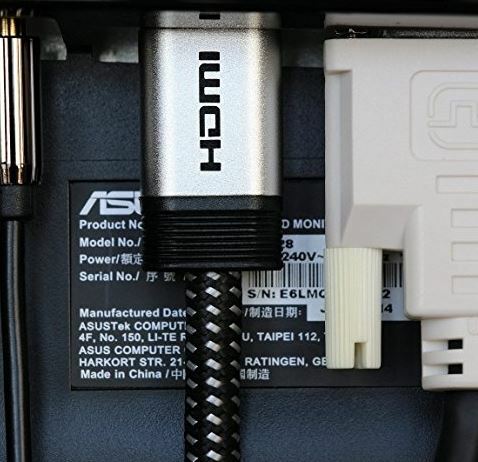 If you’ve purchased any HDMI gear in the last little while, you probably got HDMI 1.4 hardware. HDMI 2.0 doesn’t necessarily require new cables, but that’s assuming that your previous cables were built to the highest standard. 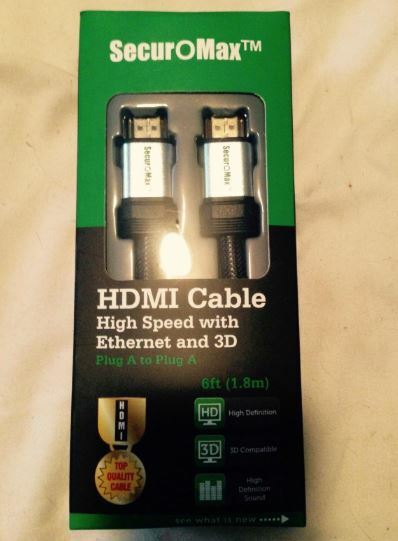 HDMI cables are typically an inexpensive item. The gross majority of affordable cables are built to be as cheap as possible, and manufacturers didn’t see much value in building in support for standards that weren’t yet in use. If you purchased a premium HDMI cable, you might want to test it out first before you consider replacing it. But if you’re on the market for an HDMI cable, or you used budget cables, you’ll probably want to upgrade to the latest standard if you’re planning on enjoying 4K content. For most people, HDMI cables and angle adapters are an impulse purchase. But since you’re reading our site, we’ll assume that you’re a savvy consumer who likes to understand what you’re spending your money on. Let’s take a look at the most popular HDMI 2.0 cables on the market. We’ll explain the differences between then, and help you understand which one best meets your needs. We wouldn’t really consider Fusion4K to be a manufacturer. They’re more of a curator. With thousands of off brand HDMI cables to choose from, it can be hard for consumers to understand what they’re buying. Even Monster cable, one of the most respected cable manufacturers, has had a few duds in the past. Fusion4K only carries a few products, but that’s because they carefully test and grade every product that they sell. When you purchase from them, you can rest assured that you’re making an informed decision. Even though HDMI cables are usually something you tuck in behind all of your multimedia equipment, it’s common practice for premium manufacturers to make them as attractive as possible. Fusion 4K has hopped on this bandwagon as well. 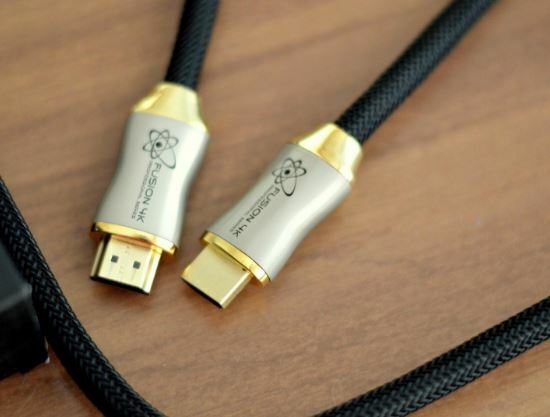 The cable itself is coated with a roped material that both looks and feels premium, but the real design highlights are found in the connector Both the top and bottom of the connector are coated with a gold material that screams premium. The center is a titanium colored material that features the stylish Fusion 4K logo. One of the biggest advantages this HDMI cord has over others is the roped cable. If you were to cut open any HDMI cable, you’d find that it’s actually several wired bundled together. Most manufacturers use inexpensive heat shrink tubing to hold everything together. This type of overlay is very rigid, and makes for a firm cable. With the roped connector, you’ll find that it’s much more flexible than you’re used to. But the main benefit is that it prevents the insulation of the internal cables from rubbing together. HDMI 2.0 is a very high bandwidth specification, so if you’re regularly changing cables or moving things around this rubbing can eventually degrade the performance of the cable. Another reason this cable is more durable than your average run of the mill model is the thick contacts inside of the connector. These can also wear down over time when you’re regularly plugging on unplugging the cable. 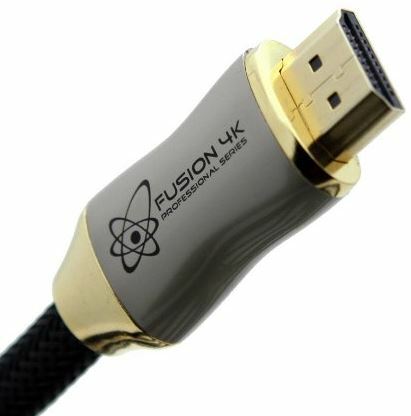 But Fusion4K spared no expense with this HDMI 2.0 cable, and made sure that all of the common points of failure were reinforced. This cable supports both HDMI 2.0 and 2.0a. 2.0a is technically part of the standard, but not every cable supports this. This is what facilitates the transmission of HDR content. 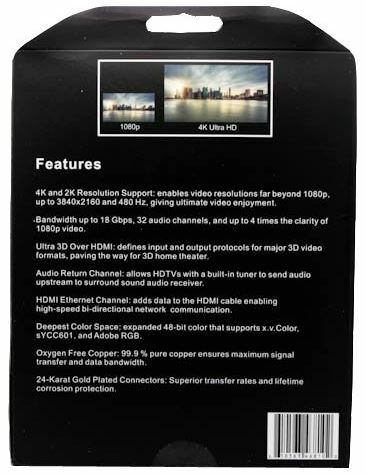 At the time HDMI 2.0 was designed, HDR was just a niche product that was not yet available to consumers. But today, there are many commercial HDR films available, so it’s imperative that this standard is supported. As an HDMI 2.0 cable, this one supports the full 18 Gbps bandwidth. We don’t have an exact figure, but the shorter cables can surely support higher bandwidths. We know this because of the length. Just like with wireless networking, data is lost over distance. Just because a cable design can transmit 18 Gbps over 2 feet doesn’t meant that it can transmit the same amount of information over 10 feet. But this cable is available in lengths of up to 50 feet. If you’re not purchasing such a long cable, there is a pretty good chance that this cable is something you might have for years to come. When they release a new standard that requires more bandwidth, you’ll be happy that you picked on that was built to such a high standard. If you’ve spent any amount of time shopping for high end HDMI cables, you’ve surely come across a Monster product. They’re one of the most popular manufacturers of top tier cables. With such a huge market share, they must be doing something right. We decided to look at their top tier HDMI 2.0 cable to see how it stacks up to the competition. Monster really nailed the design with this one. 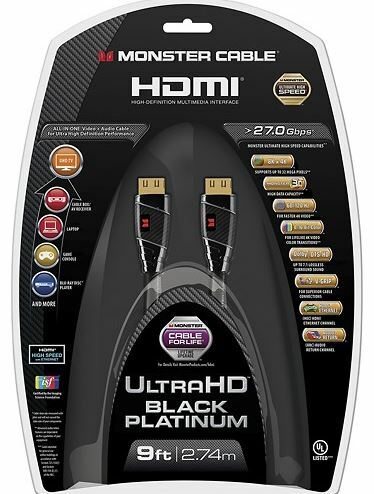 From a distance, the Monster Black Platinum HDMI Cable doesn’t seem too different from most. But when you get a close look at it, you’ll know for sure that this isn’t your standard cable. Monster used their stylish high-gloss metal connector that has just a single black band on it. The band isn’t centered, instead being wrapped at an angle. It’s almost as if somebody had draped ribbon around the connector and left it there. Inside the black band you’ll find an argyle textured finish with a small Monster logo in the upper portion. We often use copper as a conductor, but what you may not realize is that Gold is one of the best conductors we have. Monster has plated all of their conductors in gold. Not only does this allow for better performance, but it makes the cables resistant to oxidization and corrosion. While you might be unhappy if you were to receive gold plated jewelry instead of something made from solid gold, this is actually a benefit. Gold is a very soft metal, so the hardened core allows the contacts not to wear out over time. Now that we know that the connectors are solid, what about the rest of the cable? The cord itself is very well made. It uses an ultra-flexible rubber material that is popular in car audio. This type of cable is more resistant to temperatures, such as hot exhaust from a powerful amplifier. It’s also capable of a lot of movement, without damaging the internal cable structure. This is much more important with high end cables. These cables are carefully arranged and twisted to reduce what’s called “inductive capacitance.” Which has some bandwidth implications we’ll get into shortly. Although this product is brand new, it’s being sold under two different names for the same price: HD and Ultra-HD. Technically, these cables are the same. The only difference is the name on the packaging. All of them are capable of the full HDMI 2.0a specification, allowing you to enjoy full 4k resolution content with HDR, 7.1 lossless surround sound, and massive bandwidth. Monster made sure that their cables were fully rated for the full 18GBPS bandwidth required by the HDMI 2.0 standard. But they didn’t just meet the specification, they went well above it. With 27 Gbps of total throughput, you know that these cables will handle whatever you throw at it both today, and in the future. Just looking for an inexpensive way to enjoy the latest content? Even though this cable isn’t advertised as an HDMI 2.0 compatible device, we found that it does exactly that for a very low price. For such an affordable cable, we’re surprised with how good the SecurOMax HDMI Cable looks. The connector has two separate parts to it. The first is the shiny silver HDMI connector. It’s got a nice aluminum design with rounded edges that are both comfortable in the hand, and pleasing to the eye. The base has a ribbed rubber end which adds a nice little accent to an already attractive cable. But our favorite part of this cable is the carbon fiber styled encasement. Although it’s a simulated design, it’s still very enjoyable to look at. Although this HDMI cable looks very similar to the higher end models, it’s still just a basic cable. Under the threaded fabric is the same rubber cord that most manufacturers use. The biggest issue with rubber cords is that they can often separate from the connectors over time. To correct this, the ribbed rubber topper is very flexible, allowing it to bend without causing damage. This cable uses high grade 28AWG wires that allow it to meet all of the HDMI 2.0 specifications. Although it’s not rated for HDR content, we tested it out with and found that it works perfectly. We can’t say that it’s 100% compliant with all of the upcoming revisions, but we can tell you that it works fine with multiple audio streams, HDCP, networking, and 2160p content. Although this isn’t the longest cable on the market, it’s rated for 18 GBPS of bandwidth. You’ll have no problem getting this result with almost any device, allowing you to enjoy any content that requires HDMI 2.0. Which HDMI 2.0 Cable for 4K is Right for Me? On a basic level, all of these cables are fully certified for 4K content. The one that you choose depends on how much you’re willing to spend, and how long you expect your cable to last. 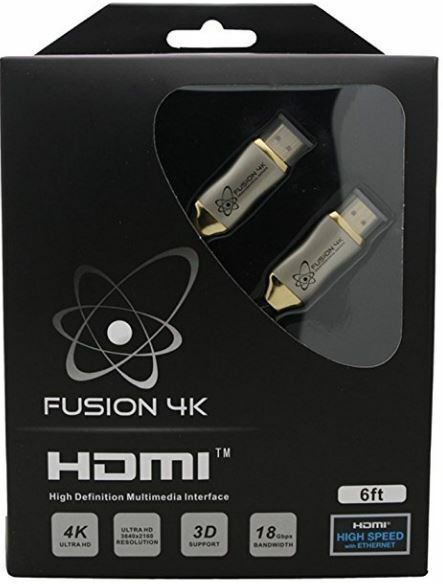 If you are looking for a cable that can be used to hook up a 4K projector, or other portable equipment, you’ll want to go with the Fusion4K High Speed 4K HDMI 2.0 Cable. 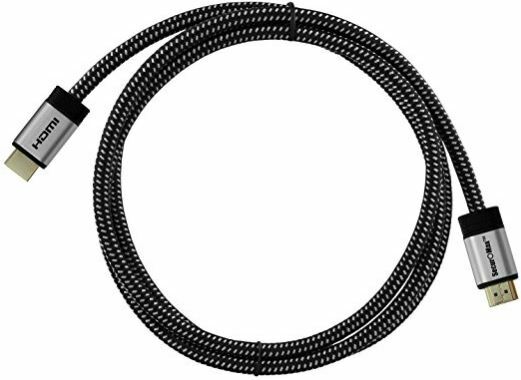 This cable is one of the most durable on the market, making it well suited to applications where you are regularly moving it around or changing the arrangement. Alternately, maybe you’re looking for something that will last you through several generations of your media center. The Monster Black Platinum HDMI Cable isn’t just rated for HDMI 2.0, it’s rated well in excess of the maximum bandwidth. Let’s face it, technology tends to change overnight. If you had purchased a high-quality cable like this monster one before, you wouldn’t need to upgrade now. A few extra dollars spend now can save you money in the future. Let’s face it. For some, there is no point in purchasing a top dollar HDMI cable. 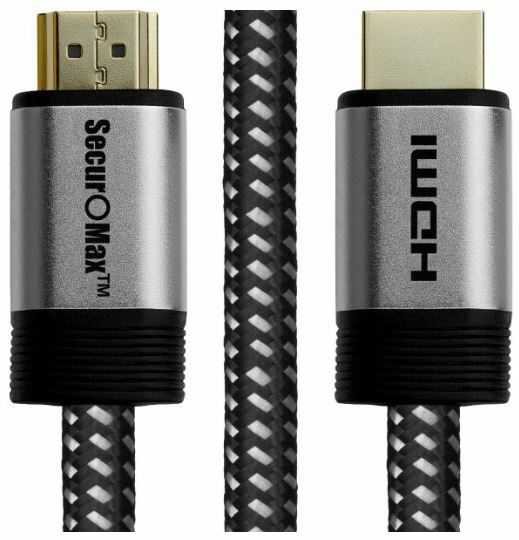 If you’re just looking for something simple that you can use to hook up your new 4K Blu-Ray player, check out the Secur0Max HDMI Cable. This cable is ideal for people who take the “set it and forget it” approach to their home media center. If you don’t plan on moving the cable around much, you won’t have to worry about how durable it is. I would look no farther than Fusion4k. They sell a top of the line cable sparing no expense. If have replaced all my hdmi cables with fusion4k. I’m now starting to use there displayport cables as well.